This article is about the novel. For the patch with the same name, see Patch 2.0.1. For the song with the same name, see Before the Storm (song). For the monk quest, see [98 - 110] Before the Storm. Before the Storm is a novel written by Christie Golden taking place after the events of Shadows of Argus but before the Burning of Teldrassil. It serves as the lead-in novel for Battle for Azeroth and focuses on Anduin Wrynn and his role of High King of the Alliance, and Sylvanas Windrunner. It is available as an audiobook and ebook. For peace to be possible, generations of bloodshed and hatred must be brought to and[sic] end. But there are truths that neither side is willing to accept and ambitions they are loath to relinquish. As Alliance and Horde alike grasp for the Azerite’s power, their simmering conflict threatens to reignite all-out war—a war that would spell doom for Azeroth. Arthas: Rise of the Lich King originally described Calia Menethil with blue eyes. Here, they are described as blue-green but also as sea-blue. The book says that Galen Trollbane was killed at the site of what was later named Galen's Fall. In the game, Galen was killed in the Sanctum of Stromgarde Keep. During a meeting with Alonsus Faol, Genn Greymane is described with "his tail lashing the air". Genn, or worgen in general, do not have tails. This error was acknowledged by author Christie Golden who imagined worgen with tails. While historians had caught the mistake, one instance was missed. Although Saraka the Lighteater was a void god, it was called a void lord in the book. The Void Lord and Shackled Voidlord share this trait, and the term is used rather loosely elsewhere. The book says that on the Broken Shore, after Vol'jin killed the demon that stabbed him, he continued to fight. In the cinematic, he collapsed right after slaying it. Despite Magni being able to sense Azerite, he only realized that Anduin had Azerite upon his person when the King of Stormwind revealed it. During a meeting with Alonsus Faol, Anduin thought how Turalyon "had doubtless encountered dark things, including truly evil Forsaken". This is technically impossible, because Turalyon was far away, when the Scourge ravaged his homeland. On the other hand Anduin could potentially refer to the death knights of the Shadow Council. Netherlight Temple is supposed to be for followers of both Light and Shadow, the whole building being divided into two separate wings respectively dedicated to each force. But in the novel, it is depicted and described as a temple to the Light, whose inhabitants all serve the Light. In the Alliance's Legion epilogue cinematic, Anduin gave his speech in a sunny weather. He was bare-handed during the conversation with Shaw who showed him the Azerite in his bare hand as well. In the novel, it was raining (although it also states that the weather became better during the speech), Anduin had gloves and only removed them before taking the Azerite, which was wrapped in cloth. Anduin wasn't facing Shaw during the conversation in the book, and he is described with Fearbreaker with him, while no weapon is seen in the cinematic. Anduin speech itself is not identical to that of the cinematic and is, in fact, expanded. Similarly, the conversation between Anduin and Shaw is not identical as well. Artwork featuring Anduin and Sylvanas. The novel's events starts with the Legion epilogues, after Sargeras stabbed Silithus with his sword and it predates the Burning of Teldrassil, and as such takes place before Elegy and A Good War. As it mentions that representatives of all the Horde races were present in the Undercity and it lists orcs, trolls, tauren, blood elves, goblins, and pandaren, with no mention of the nightborne elves or the Highmountain tauren. The book deals with the factions of the Horde and Alliance and the allied races are not mentioned at all, hinting the book happens before the opening of the embassies in Stormwind and Orgrimmar and the recruitment questlines for the allied races. The book also happens after Windrunner: Three Sisters as its events are clearly referenced. 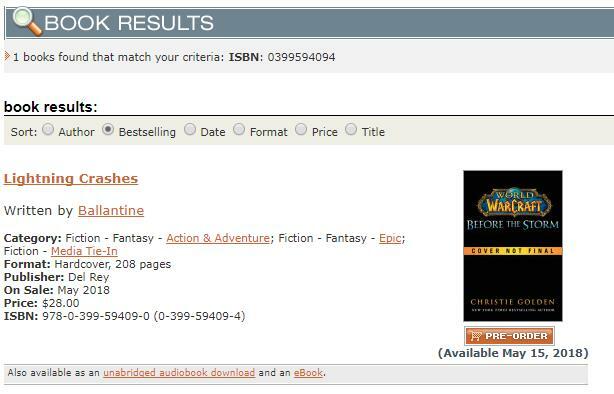 It seems that the novel's working title used to be "Lightning Crashes", as one could find by running the book's ISBN on the Random House website. Christie Golden first announced on Twitter that she was writing a new Warcraft novel — after a three-year hiatus — on July 23, 2017. After Golden was approached by Blizzard to write the novel, she was informed of what would happen in Battle for Azeroth. They wanted her to delve into the mindset of both Anduin and Sylvanas. Golden desired to look at the different leadership styles of both characters. The audiobook version is read by Josh Keaton, Anduin's voice actor. The novel reached #9 on the New York Times bestseller list. It has been stated to be one of the best received novels Blizzard has released. The special edition of Before the Storm resembles an exquisite leather-bound book that one may stumble across in the great Dalaran library. ^ World of Warcraft: Before the Storm (BlizzCon Limited Edition). Blizzard Entertainment. Archived from the original on 2018-11-02. Retrieved on 2018-11-01.